Here is the PCF for TSV31 above zero today and below zero yesterday. You can just plot the moving average for TSV on your own. I have not added this to the mix in my example below. Wow! that worked out quite nicely, thank you very much. I have plotted a 25 bar mvgavg, but that was part of the default setting when I copied the settings. what would a pcf look like for a TSV31 crossing up through it's 25 bar mvgavg? Thanks for the input, I created pcfs for both,used them in a scan, came back with 13 stocks. In each case, the tsv31 was moving up through the zero line, and also crossing it's 25 bar SMA. a few charts look interesting, HSA, FPO, VCLK (looks like an Island bottom, and possibly an inverted H&S bottom. 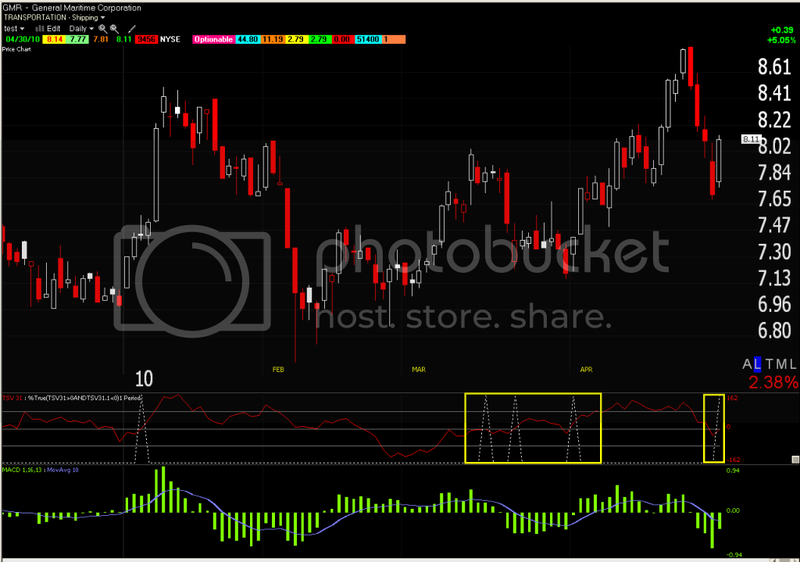 MTS has several indicators confirming each other, tsv was rather late to the party. and TOO. tsv31 made a swift upward thrust through the zero, after a bounce off it's 25SMA FPO, tsv has been in a complete divergence until 2 days ago when it made a swift move above zero, several other indicators made similar moves as it bounced off it's 50 SMA. I'm new to this forum, not new to trading, was curious on your take in terms of market direction. I agree with Worden's comments last week when the S&P broke through support. We are due for some sort of correction or pullback. That being the case, most of these upward trending stocks will be running counter to the overall trend . DISCK might be an extraordinary exception, mighty powerful move underway. Who can say if market turbulence can derail that runaway train? I have 8 indicators that all look pretty much the same for DISCK. OBV, MS, RSI, BOP, MACD, STOCH, Pardon the lengthy post, but again just wanted to get your feedback. A few other tickers I been trackng, DXD ENCO BPOP FMD, HOT, HST, HDSN OREX SGEN, FPO. Been in ENCO been in little over a week. added to my position in DXD last week . The latter is the desired PCF. I looked at your picks and I did like some of them but you asked me what I thought of the current market conditions. I see great weakness in the broad market indicators. 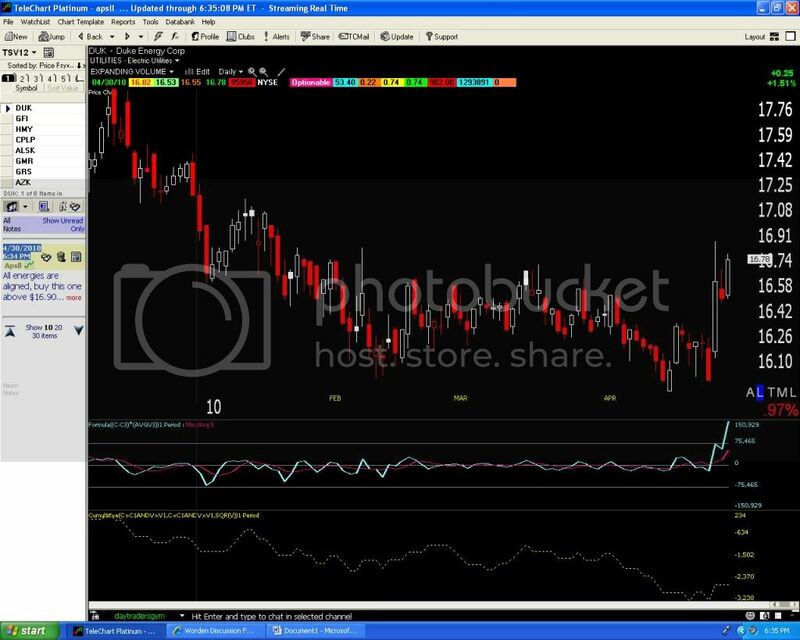 See the recent posts by Funnymony and myself on Memorableproducts "Zanger Bazillions" thread for some charts on this subject or just refer to the Worden indicators. the most important detail in this strategy is to know where price is in its range. For example one would not buy if price is moving sideways and the day of the hit is no larger than the average candle in the range. In other words you want the candle to stick out and show some promise for a follow through day the next day. You will get many hits that will lead you no where so on the first day of your entry you must use a very tight stop. Maybe one out of four hits will lead you to profits so sell your loss small and the winner must be played for all that you can. You have to love the fast action in order to pull this off. Here is a chart that is a good example. PS: Always go with Bustermu"s advice by the way. He is the master of indicator formulas around these parts and one would be foolish to dispute him. Thanks for your confidence in me, but I am not always correct in stating "facts". Never accept what anyone states as a fact. Always prove it yourself. "I will adjust my formula's accordingly." Its trickier than it looks. Thanks bustermu, and aspll. I am curious aspll how do you use that indicator, in the form of a pcf? 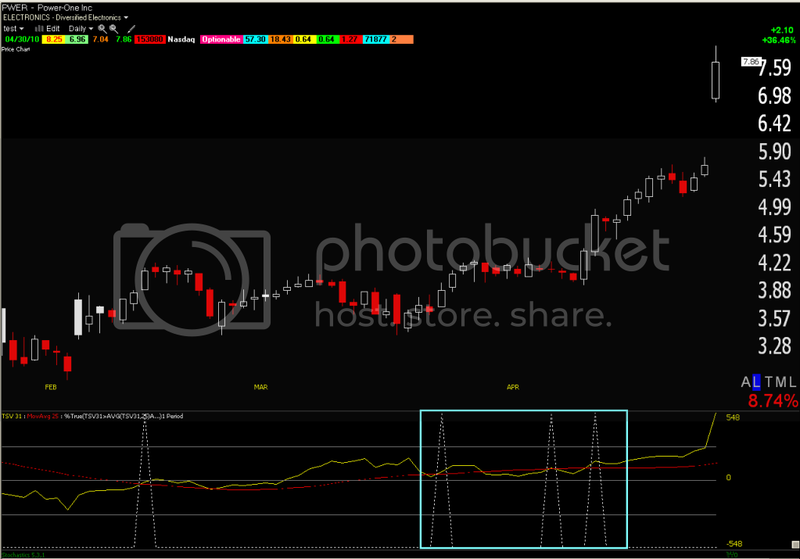 or as a plotted custom indicator? Can you share which symbols you thought looked good? I have been waiting for this correction to get underway, missed it everytime I went long DXD and got burned. I use pretty tight stops, but I feel we are way over due for some pain and in this case, if I'm right some payback. Ransom, you already answered your own question. Just add the indicator formula into your PCF library. The Markets are not stable right now in my opinion for holding over night. Best to day trade with one eye on the intraday market numbers. Here is a short list that I will be watching on Monday for day trading. Hi - could someone send me a download file of final TSV31 PCF? I am struggling to learn Real Code. APSLL thanks again btw, ALSK also came up on a few of my scans the past couple of weeks. A breakout seems likely, but will it fail if market sells off? DUG looks interesting. 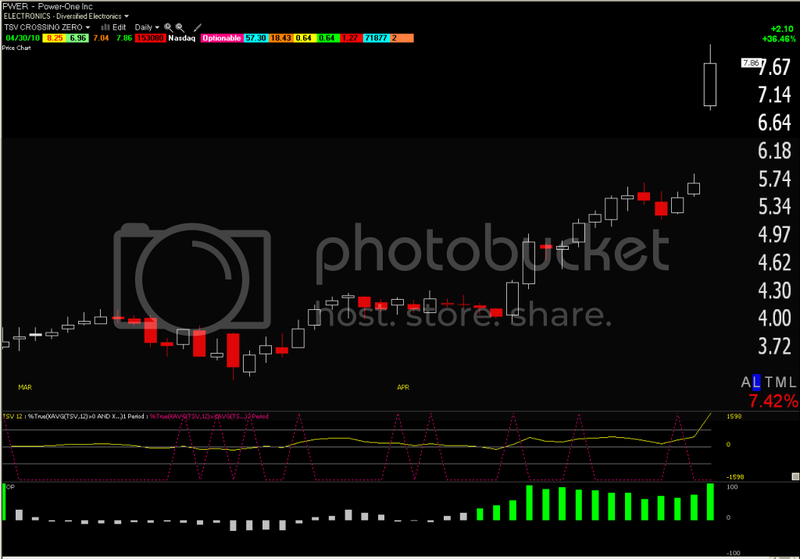 BOP, MACD, OBV, MS STOCH are all trenidng up, I have a custom RSMA indicator crossing up through it's sma. volume has picked up the past 3 weeks and TSV has turned up decisively, about to cross zero. All the talk on the street about oil going to 100 got me to thinking it's probably time for a pullback. One would think the big oil spill would impact price to the upside. One would think..... SNV looks very tempting with a tight stop down around 2.90. or perhaps maybe 2.87 to avoid the obvious.